The musicians display inventiveness in their approach to music from Denmark, Sweden, and Iceland plus the far reaches of Greenland and the Faroe Islands. The ensemble has won five Danish Folk Music Awards and has toured across Europe, Japan, and Australia. The players, two Danes and a Swede, view their roots as a point of departure, not a straightjacket. 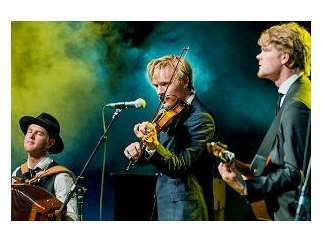 This adventurous attitude, coupled with outstanding musicianship, has brought the trio to the forefront of the Nordic folk and world music scenes.